Orange and white shirts spontaneously filled the corner of Madeline Dr. and Orange Grove Blvd. at 10 a.m. on Mar. 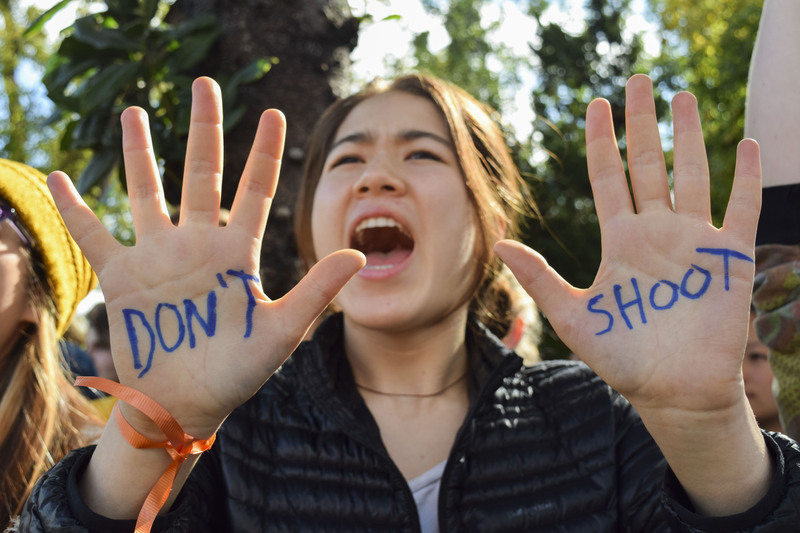 14 as Westridge students filed out of their classrooms to join the rallying cries of Mayfield Senior students, alerting residents and passersby of their contribution to the national outcry against gun violence. As Mayfield and Westridge joined thousands of students in the national walkout, they set aside their sport and academic rivalry to band together with signs, ribbons, and most importantly their voices so that all of Pasadena could hear their pain, anger and activism. Tears flow down the cheeks of students as the number of participants in their movement continued to grow well after the 17 minutes scheduled for the walkout were over. The students flooding the busy street were met with support as nearly every car that drove by honked their horns and shouted out their windows in support. Westridge students shouting, “Enough is Enough” at the cars passing by, protesting gun violence in schools across America. A facet of controversy on this day was the participation of the middle and lower school students in this walkout, as an email from the administration dated Mar. 8, addressed only to the upper school students, informed that a group of student leaders were organizing the participation of Westridge in the national walkout. The email stated that the student body would walk out to the school field to be together as a community in memoriam of the events of Parkland. However, when Westridge students heard the cries from Mayfield across the street, the plan was forgotten and passion took over as the upper school students ran outside to join them. Despite middle and lower schoolers not being included in the official email informing of the plans to participate, they saw their older sisters of Westridge walking out, and climbed both the walls behind the playground and up to the tops of trees overlooking the sidewalk and contributed their own voices in the event. After about 10 minutes of chanting, a maintenance truck with a microphone was staged in the Madeline Drive cul-de-sac, and Westridge students read the names of those who lost their lives in the Marjory Stoneman Douglas shooting. A Westridge junior mourning while holding a sign with the names of the 17 who were killed in the Marjory Stoneman Douglas shooting on February 14.